This Deluxe Thigh Support is preferred by pros. The longer support with oval patch for added compression helps reduce muscle strains and pulls. Reversible thermal neoprene support with nylon facing on both sides, with black color one side and scarlet on the other. Extra long professional design with patch. 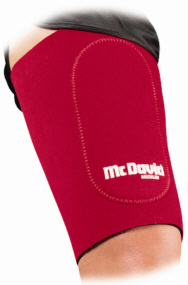 Firm compression and soft tissue support. Retains warmth and promotes healing. Major muscles of the legs do not lose energy due to unnecessary motion and vibration, because they are uniformly compressed by the support.